In a quiet residential district, 1.9 miles (3 km) from the city center, port, and beach, the reception at the hotelF1 is open 24/7. 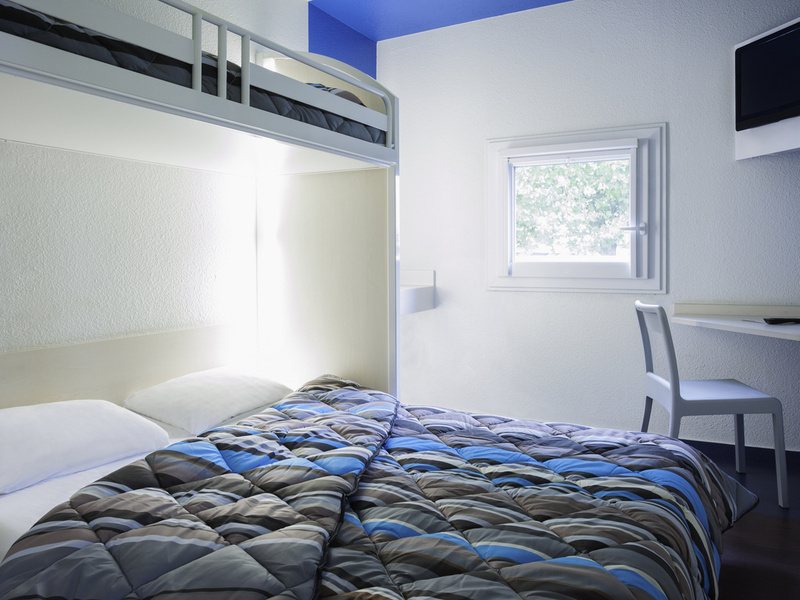 Close to a shopping center and restaurants, it offers TRIO rooms for three people equipped with sinks, TVs, and free WIFI. "Shower and bathroom" area available outside the rooms. All-you-can-eat breakfast buffet and snacks/beverage dispenser. Free private indoor parking. Didn't stay, error in reservation, charged anyway!! No Problem with booking, room clean, staff friendly, breakfast good. good value all round. Very convenient for the first night in France off the evening ferry from Newhaven. Easy to find using Satnav. Place is showing some wear and tear but was clean. Our room was at the back and very quiet, so we got a good night’s sleep. Initial difficulty in locating the premises, I think it needs more advertising on the main road approaches. Good secure parking, 24/24 reception, hardly any noise from outside, and a hot drink with breakfast . Rooms & beds clean & tidy, but some of the toilets were below standard. No plugs in the personal wash-sinks! That was very annoying. However, overall good value for money. We arrived late from the ferry but were welcomed and able to settle quickly for the night in Dieppe. Breakfast was good. Impressed with the secure parking. facilities as expected for budget accommodation. the building was tiered and as so looked dirty. Not for an older single woman traveller! The hotel room was clean and tidy and the location was great for my journey. On arrival the reception greeting was pleasant, however due to some internet issues they tried to charge me for two hotel rooms but once we explained the situation this was resolved without further complications. My only grievance is that the toilets and shower facilities were not very clean. I’ve stayed in plenty of budget places and this wasn’t the worst, but the bathroom situation is awful. Shared loos without sinks and showers opening onto reception and the front door. Declined the icky showers and felt v uncomfortable walking past the queue to the smelly loo to my room. Beds hard and pillows lumpy, but could cope as this is budget. Wasn’t keen on the sticky floor.good to have a sink to wash but shame no hot hot water. Do yourself a favour and pay a few extra Euro and go to ibis (as I did on return) or camp. No wash basin in toilets ! The room is adequate. But there is no toilet or shower facility in the room. Toilet and shower are separate from the room down the corridor. There is no hand wash basin in the toilet. You have go from the toilet after using it and walk back to your room where there is a sink to wash your hands - in other words - after using the toilet - you touch all surfaces - including door handles - when you return to your room. THAT IS DISGUSTING.